Internet advertising can keep your name out front. Recent statistics reveal that 98 percent of construction contractors use the internet at least once a week. And 73 percent use it more than once a day. Furthermore, 83 percent of you buy construction products online. You’re going to manufacturer sites, finding industry news, checking prices and doing a lot of research about everything from financing to equipment rental. Guess what? Your customers are doing the same thing! In the tumultuous economic times we are in, the advertising budget is usually first to go. It’s certainly easier to cut back advertising than it is to cut jobs, for example. Yet surveys prove over and over that the business that continues to advertise during an economic downturn emerges stronger and better positioned than its counterparts who cut advertising to the bone to survive. An excellent way to maintain a strong presence during the downturn is to focus on your Internet presence. It’s not just contractors who are researching and buying online, it’s your customers as well. Strengthening your Web site and its content can be an extremely economical way to keep your name in front of your customers. First of all, if you don’t have a Web site, get one. Go to http://www.google.com or http://www.yahoo.com and look for “More” on the Google® page, and “Small Business” on Yahoo!®. If you already have one, and most of you do, make it work harder for you. Here are some suggestions to make your site more informative and more useful to your audience. • Do some research about Search Engine Optimization (SEO) and the methods to increase hits to your site by savvy use of key words and content. It is not difficult to significantly improve your findable position nearer the top of the results that come back when people use Google®, Yahoo!® and other search engines. • Instead of a static, online brochure, regard your site as a living, breathing organism that needs to be fed at least once a month, preferably every day. Figure out how to update it as often as you can. Give visitors a reason to come back often. After all, content really is king, and a picture really is worth a thousand words. • Depending on the nature of your business, this updating could range from new photos of recently completed driveways or parking lots or sealing or striping projects, to daily or weekly videos of progress on a large project. Technology has advanced to the point where it is simple and inexpensive to put photos – even videos – on your site. • Your best content source is your ongoing activity, showing people what you are doing. It’s far more difficult to put up written articles or reports every week. We all learned show-and-tell in kindergarten, after all. If you have something to say, produce a short video of yourself saying it rather than trying to write it up. You don’t have to be the greatest orator of all time. If you really believe in your message, go for it. Shoot yourself in conversation with someone else, discussing the topic. There’s no need for a formal script or rehearsal, just your authentic self in conversation. And consider this: You don’t have to be promotional all the time, selling, selling, selling. Presenting simple informational or educational commentary is just as valuable to your bottom line. It helps visitors to see you as a leader and an expert when you offer them valuable information. You might feel strongly about community infrastructure needs, or environmental issues. 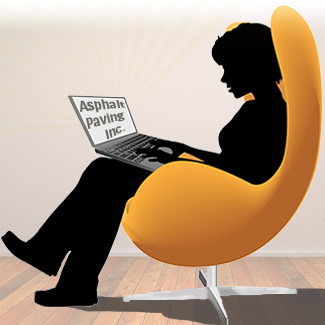 The environmental advantages of asphalt are often overlooked by the general population. When you acquire a new piece of equipment, shoot a video of yourself showing off its features and what they can do for the customer. If you buy used, make a before and after video of your team fixing it up, again, pointing out its functions, explaining why you bought it and how it can benefit the customer. You could have an online contest for some lucky homeowner to win a free driveway upgrade, or for a small business to win a free parking lot seal or stripe job. Be sure to collect the e-mail addresses of all who enter the contest for future contact. Start a weekly “Meet the Employee” program where you conduct a two to five minute conversation on video, introducing one of your workers, one each week or month. Or shoot similar snips of your latest customer, explaining his or her satisfaction with your work. Other possibilities include an article on “How to Choose a Contractor,” “How to Avoid Driveway Fraudsters,” celebrate your business anniversary with a month-long special offer, a report about a conference or seminar you attended, hew hires. You may not think so, but you have a lot to say. Lists are great – the Top Five (or Seven or Ten) signs you need a new driveway or parking lot, the Top Eight reasons to seal and so forth. If you do any type of charity work, mention it, with a link to the charity. Outside links are good for your site traffic; the more links you have, the more you get, and that promotes visitors to your site. The point is bustle, activity, life, movement and new information on your site. Every time you add something to your site, even a link, the site moves higher in the search engine results. For example, have you noticed that when you search Google®, you get local results first? So, when people search for “asphalt” or “driveways” in your area, your business should be coming up in the top few listings. Frequent changes will make sure you are among the top results searchers get back. The original point to this article is that it is relatively inexpensive to enhance your site as compared to other forms of advertising – particularly print ads or even broadcast media. As with many things, you can spend from $50 to $5,000 or more on your site. The trick is to find simple ways to either do it yourself or find a reasonably priced programmer to do it for you. With a bit of research, you can discover how easy it has become to manage your site yourself. The second, and equally important component of web marketing is to actively and aggressively publicize your site. The previously mentioned tip to link with other sites is a powerful way to spread the word. Link with your vendors and suppliers, for example. Check to see if you can link to local associations and don’t overlook complementary businesses – builder’s sites, property developers, facilities management companies and landscape companies are just a few ideas. Ask commercial customers if you can trade links with them. Make sure your www address and 800 phone number are on your business card, stationery, invoices, as well as every shirt, ball cap, truck, paver, broom and wheelbarrow. Make sure your web address is in your yellow pages ad. People who see a regular, numerical phone number on a billboard or passing vehicle rarely remember it. But anyone who sees 1-800-ASPHALT or http://www.freds-striping dot com can remember and look you up later. And, most people have learned that they prefer to check the site before they pick up the phone. They know they can get many answers to their questions and a feel for your company on your web site 24 hours a day. A final advantage to web site marketing is that once you know how to update frequently, your site can economically present a current snapshot that projects the vitality of your business – even during a downturn.